My mum’s attic is a narrow crawlspace some four feet high and seventy feet long. If you imagine poking around inside a building’s intestine, you’re most of the way there. I was up there the other month, scrambling around on my hands and knees and squinting through sweat and dust when I found exactly what I was looking for. 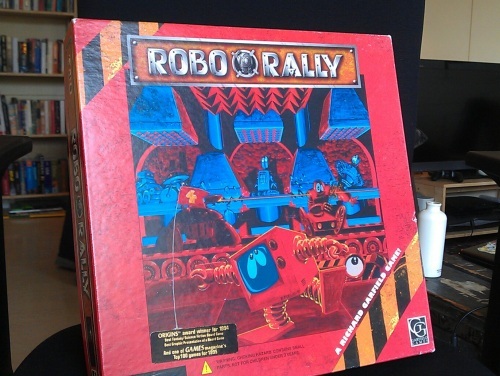 A box containing my old copy of RoboRally. Hell yes! 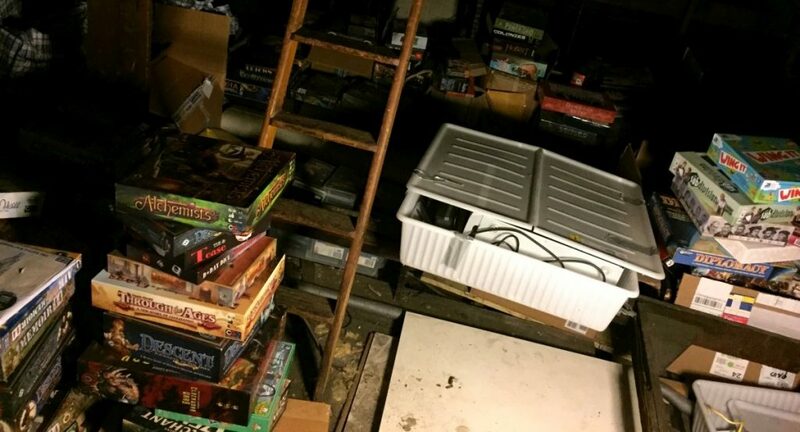 A lot of people have a board game they owned as a kid and consequently played to death. 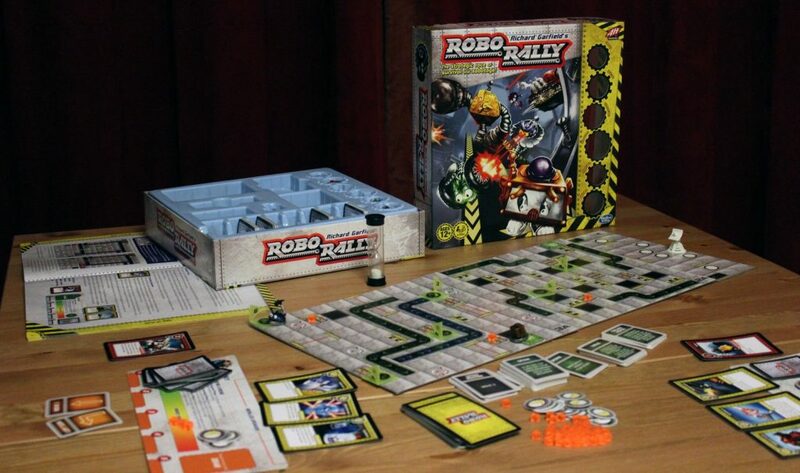 RoboRally was mine. I am eternally grateful that it was, and still is, a phenomenal game. It’d be a depressing thought to have spent all those years coralling my friends into playing Atmosfear or some crap. I speak here with authority, seeing as I had a friend who spent years coralling me into playing Atmosfear. To this day you can still shout “Stop! Who’s turn is it next?” at me and I will instinctively turn and dropkick the nearest old man. 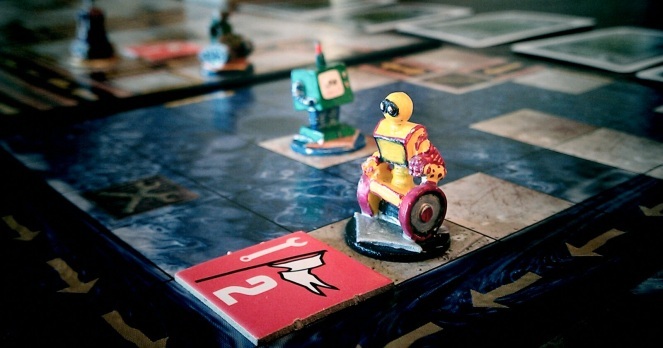 Anyway, RoboRally casts the players as hyper-intelligent AIs supervising some far-future factory. Bored out of your magnificent minds, you amuse yourselves racing robots across a huge, modular factory along race courses that you, the players, design yourself. Those cards you see in the above image? Those are program cards, which all the players are dealt a hand of each turn. To race your robot onwards you have to program your cute little representative with five of these cards by placing them facedown, so that when you flip left up from left to right your robot will first move forward two squares, then turn right, move one square and so on, and you must plan all this out without touching the board. In theory. I say again: you have tok do all this in your head without touching the board. And trying to figure out where your robot will get carted off to once you walk him onto that conveyor belt, or whether he’ll get stomped by that hydraulic crushing piston as he saunters under it. Not many games offer you a challenge that will get the better of everyone with such incredible consistency. It’s fantastic. 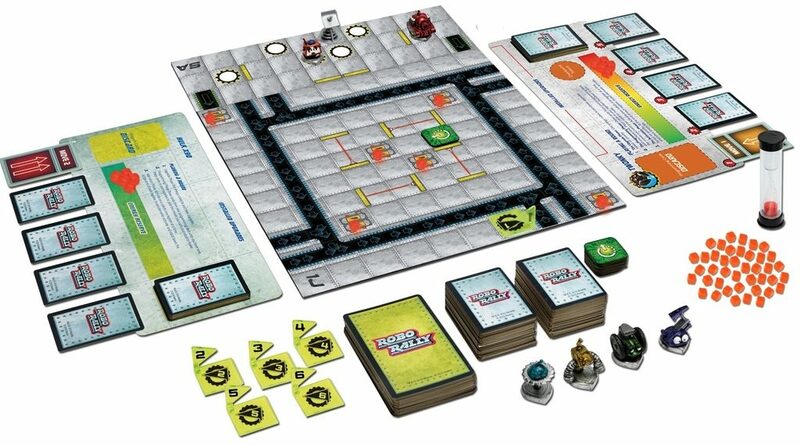 But all this wonderful puzzling comes second to how funny RoboRally is. It’s perfect. Everybody hurriedly lays out their program cards, then you all look at one another with a visible poverty of confidence before finally flipping your first cards face up, causing all hell to break loose. Steve’s robot immediately darts forward and rams Jess, knocking her robot off course and turning her meticulously plotted course into a magical journey into mystery. Steve later gets his comeuppance as his giddy robot goes racing excitedly into a pit thanks to a program card that Steve cannot remember placing or even receiving, stunning him into silence. Meanwhile, the pitiful hand that was dealt to Joey is revealed to the table as his robot first does a u-turn and then begins waddling backwards very slowly in the direction of the chequered flag, because he’d received an entire hand of “Back up” cards. Did I mention there are weapons you can attach to your robot? Oh, yes. 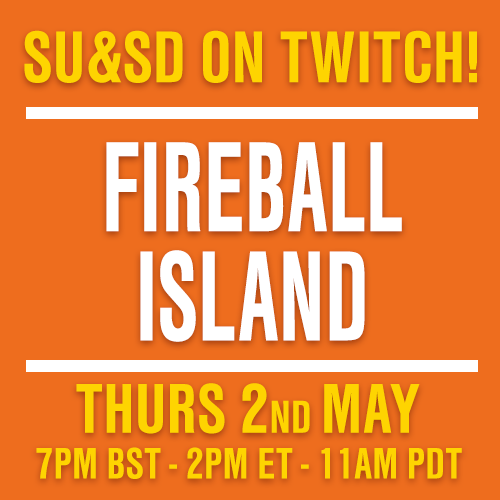 And crab legs, rocket packs, bridge-laying devices, teleporters and a few dozen other theoretically useful bits of kit just waiting to be lost when you accidentally run your bot into a jet of flame, the rest of the table laughing as your lead literally melts away. When you buy a board game, there’s an immediate urge to try and keep it as pristine as possible. Some people even buy plastic card sleeves to keep every single card looking factory-fresh, nobly accepting or ignoring the fact that the message this sends to your friends is that YOU ARE DISGUSTING and it makes holding a hand of cards about as fun as holding hands with a mannequin. Let me tell you about my copy of RoboRally. The cards are browned, having spent whole days being clutched panickedly by imperfect, dirty humans. My imperfect, dirty friends and family, in fact. My childish paintwork covering the metal miniatures is chipped. The box looks like it took a fall from a high shelf, which it might have. I can’t remember. The thing is, the game now looks as worn as something you’d find in a dangerous factory. It also reminds me of every fantastic time I had with it, every photo finish and every one-in-a-million belch of laser fire that ended up clipping the leader of the pack, damaging them to such an extent that their first program registry became locked, causing them to have to turn left at the beginning of every turn. I look at this game, and it makes me think that there are worse things in life than aging. For instance, turning up a full hand of cards to see there’s not a single rotate right in there, and there’s you coming up to a right turn at top speed with every other robot hot on your heels, ready to crumple you against the wall. 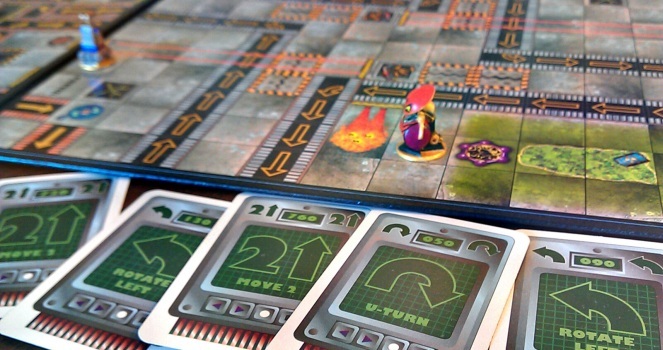 RoboRally teaches us that slow and steady does not,in fact, win the race. What wins the race is being fast, brave, hungry and lucky. It’s the truth that no parent will ever admit. What a lesson. What a game. I’d tell you to run off and buy it, but I’m really not liking what I’m reading and seeing about the edition that’s currently in print, published by Avalon Hill. It looks hideous, for one thing. If you’re interested, you might want to track down one of the copies published in the ’90s. Are you that interested? I bet you’re not. Are you? Feature: A Day in the Life of Quinns' Game Collection!